Our herd is G6S Normal. 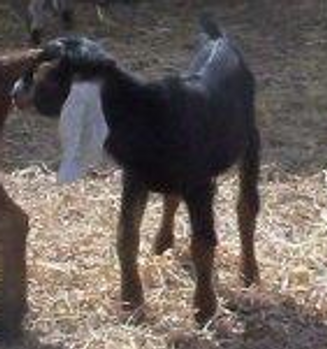 We tested our entire herd in 2012 and are relieved to know none of our does carry this genetic defect. In addition, we've casein-tested our herd so we know the type of casein milk each doe produces. Our kids are handled multiple times a day. With bottle feeding - it's easy to learn individual personalities. We pride ourselves on raising good quality kids with great temperaments and winning personalities. I don't take deposits for kids, but if you're interested, I will be happy to put you on a waiting list and notify you when the kids are born. 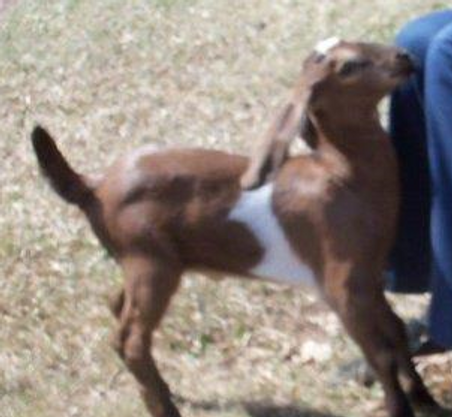 Let me know why you want a goat (for milk, show, etc. and I'll help match you with the baby who meets your needs. Doelings start at $325. Bucklings start at $350. Wethers start at $50. Most of the does already have their milk star, so their daughters are eligible for a second (or sometimes a third star) star if you decide to test. 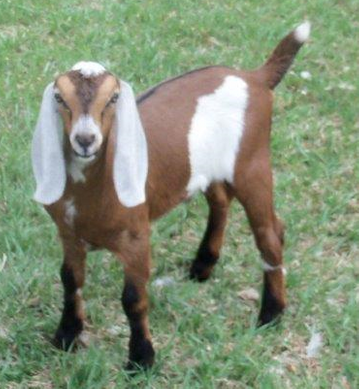 Remember - goats are herd animals. 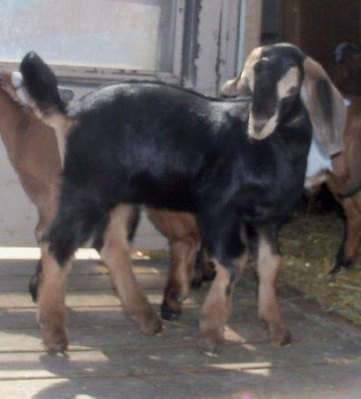 You really need two or more for happy goats OR have some other animals to be part of their herd. 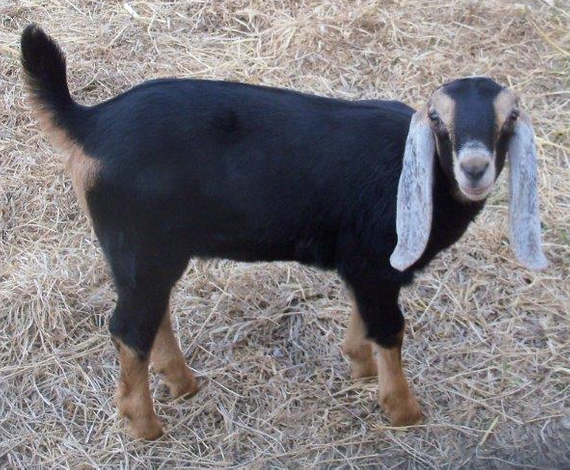 A single goat is an unhappy goat and unhappy goats make their owners unhappy, too. 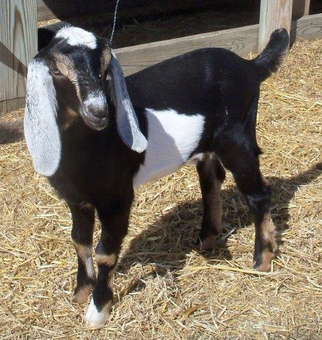 If you would like to purchase a wether as a companion for a 4-H doeling, we should have some available. 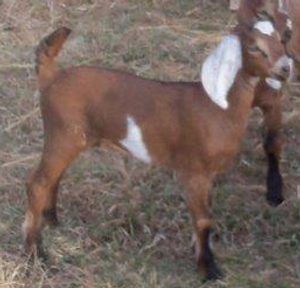 Bucklings Available - Only those kids with proven dams are available. Their dams are at least second generation star milkers. "Righty" is mostly black with a white spot on his right side and a bit of white on his right front foot. His brother "Lefty" (also available) has the white mirror-imaged. The son of Dimples and Atlas, he's strong and broad with plenty of breed character and a winning attitude. Click here to see Righty's pedigree. "Lefty" is the mirror image of his brother Righty. These two are simply delightful together. In fact, if someone is looking for a pair of pack goats or wants a "matched" pair for a cart, I'd wether these two just to see them together. With a cart, if you hitched them with the white sides touching, everyone would see a matched pair. Click here to see Lefty's pedigree. Born March 30th, this son of Cherry and Atlas follows a long line of excellent bucks produced by this combination. He's sturdy with good type and great personality. A full brother was shown around the state last year with win after win. His personality was so good that he was even used for showmanship. Click here to see Cobbler's pedigree. 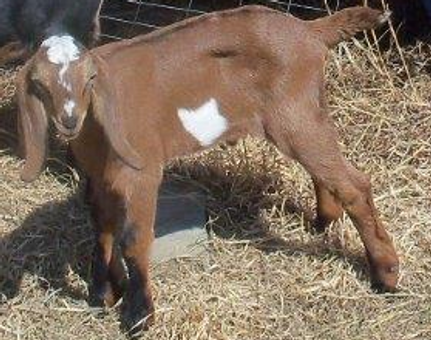 Cherry "Turnover" is the second son of Cherry and Atlas born March 30th. You can see the drizzle of "icing" down his nose. He's got all the strength and style of his father with the promise of good size and strong legs. He has three full brothers from previous breedings siring in North Dakota. Their kids are really nice. "Dandy" was the sole surviving kid from Millie's kidding. Click here to see Dandy's pedigree. Doelings - The darlings of the herd. Meet "Happy!" She's the daughter of DImples and Atlas. Born March 23rd. She's as solid as they come and nothing phases her. Yet she's not pushy, but gets along with everyone. Her mother Dimples has a gorgeous udder. We believe Happy will be follow in her mom's footsteps with a lovely disposition and even temperment. Happy's dam is a second generation star milker, so Happy could be a third generation star milker. Click here to see Happy's pedigree. "Bunny Hop" is the daughter of Dance and Paco. 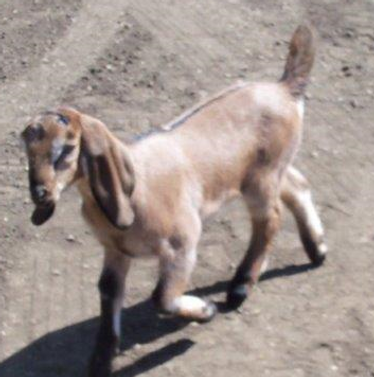 Born March 25th, Bunny was twin to a buckling. Though she was the smallest of the early kids, Bunny took the lead at every turn. She was the first to climb the milk stand, first to learn to climb steps, and first to use the feeder bucket. Her mother Dance is the easiest milking first freshener I've ever had. Dance is enrolled in milk testing and I fully expect her to earn her star which makes her a second generation star milker. If Bunny Hop participates in milk testing, she could be a third generation milker. Click here to see Bunny Hop's pedigree. Bunny Hop and Happy side by side on their first day in the barn. 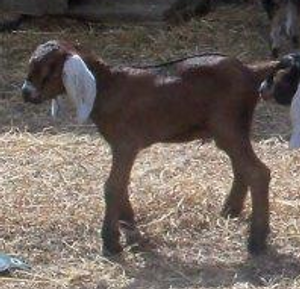 "Dinera" is the first of three triplets born March 28th to Shekel and Paco. Dinera has a lovely profile and ears like Shekel. She has a solid, well-balanced body and strong legs. Dinera will be living in Minnesota. Her mother is a 2* milker, so Lira could be a 3* if her new family participates in DHIA. Click here to see Dinera's pedigree. 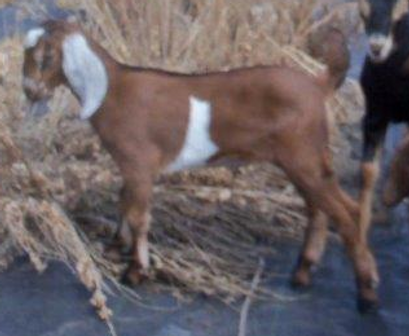 "Lira" is the second Shekel X Paco daughter. She has a very gentle, easy going attitude, and physically is very close to her sister Dinera. She would be a lovely 4-H doe and should be a powerhouse milker. Her mother is a 2* milker, so Lira could be a 3* if you participate in DHIA. Click here to see Lira's pedigree. "Bonus Money" is the daughter of first freshener Divy and Paco. This smaller version of her great granddam (and our foundation doe) is a little girl with a huge heart. She's shown at one day of age. She was just born on April 19th, but isn't afraid to run with kids nearly a month older. I'll try to get a better photo up soon. Divy has nice, large orifices and should be a powerhouse milker like her mother Millie. She's bred for extended lactations. We fully expect her to earn her milk star and become our first third generation star milker. Bonus Money, if tested, could be a fourth generation star milker. Click here to see Bonus Money's pedigree. She's going to live with a special young lady who once took care of her great granddam Mony. Here's Bonus Money at one week of age with her friend Happy (five weeks old) looking on. Wethers (neutered males) - All of these have found homes. "Gunnie" is the son of Dance and Paco. 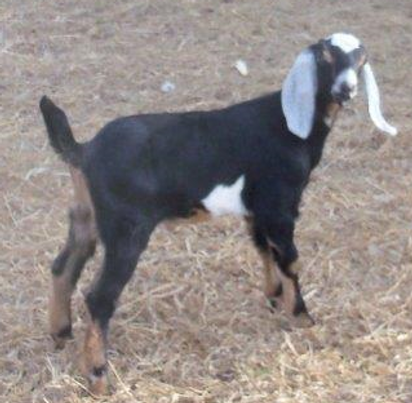 He's a gorgeous Nubian, but no matter how much we love first fresheners - we do NOT sell their bucklings intact. Instead, we wait for the does to prove themselves. 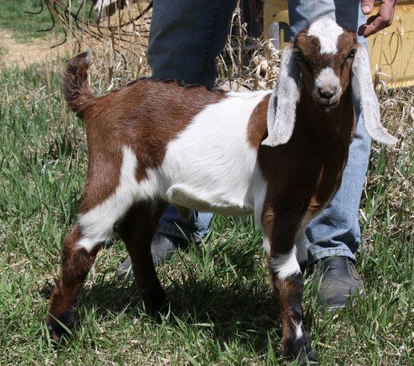 Meet "Perry," son of Divy and Paco; born April 19th. He's pictured here at one day of age. He's a large brown baby with lovely frosted ears. Perry will be available around May 1st. His horns are coming on slow, so I haven't disbudded and weathered him yet. "Mason" is Perry's brother. It would be lovely for the pair to go together. He's a large black and tan baby with a gentle disposition. Mason will be available around May 1st. His horns are coming on slow, so I haven't disbudded and weathered him yet. "Trey" is the brother to Shekel and Paco's triplet doelings. The three are extremely close in size and coloring. He's a sweet boy who quietly goes about his business. 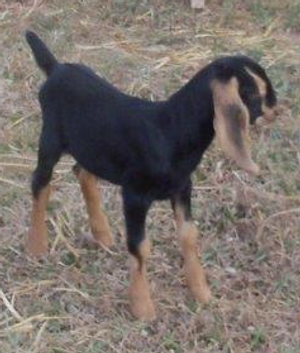 He'd be a great companion to either his sisters or another doeling.